Gluten Free Biscuit Chicken Pot Pies To Go | Great gluten free recipes for every occasion. Once the school year starts (which for us won’t happen for another week and a half, believe it or not), like every other family with young school-age kids, we hit the ground running. Sometimes literally! That means breakfast on the run, sometimes (hello no-bake granola bars!) and some nights even dinner in the car—at least for one of my three kids. So I’m always looking for complete handheld meals that they can eat in the backseat. Sitting down for a meal together is absolutely the ideal, and it happens quite often, but sometimes? You gotta do what you gotta do. No guilt. Especially when what you’re giving your kids is like a chicken pot pie … to hold in their hands. And since I always have a batch of the Extra-Flaky Buttermilk Biscuit dough from page 227 of GFOAS Bakes Bread in my refrigerator or freezer (don’t have the book? use this gluten free biscuit recipe from the blog—it’s fabulous too! ), these chicken pot pies to go are always within reach. 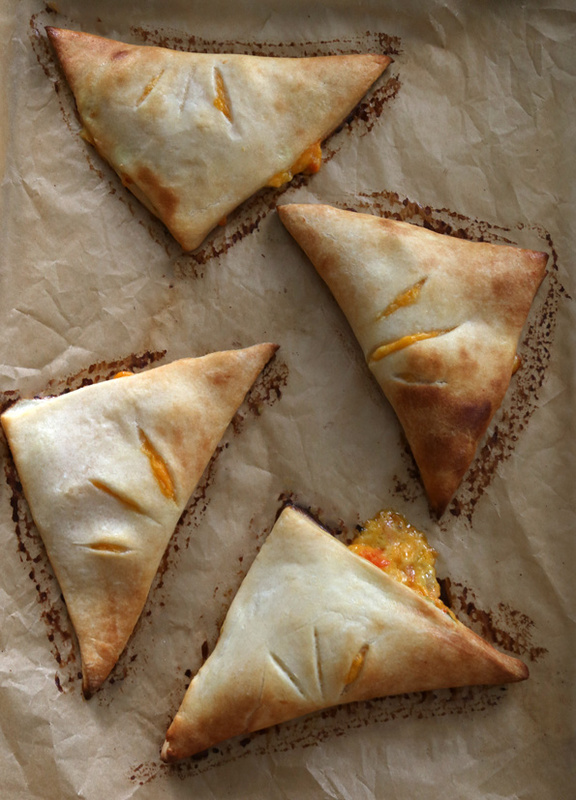 ETA: For the ultimate on-the-spot meal, shape these and freeze them in a single layer on a baking sheet, and then pile them into a freezer-safe bag and keep them frozen until you’re ready to bake them. Then pop them in the oven and bake! You might need a few more minutes of baking time once they’re frozen solid, so just keep an eye on them. Thanks, Fran! I quickly broiled skinless boneless chicken breasts for this recipe, but you could easily grill them (my current favorite marinade for grilled chicken breasts couldn’t be simpler: buttermilk), poach them, or sauté them. If you have a pressure cooker like the Instant Pot, the quickest and easiest way yet to cook boneless chicken breasts to tender perfection seems to be this recipe for Instant Pot Chicken Breasts from Kristen at A Mind “Full” Mom. I have an Instant Pot, but I don’t use it that often. I think it’s time to start! Of course, you could easily make the chicken a couple days ahead of time. I often cook a few pounds of chicken breasts and use them over the course of 2 or 3 days for everything from recipes like these chicken pot pies to a simple salad topped with chicken. Don’t feel like making the filling for these? Try making them without the filling and just with more cheese. Just don’t feel like making the sauce itself? Try gluten free cream of mushroom soup (I think Progresso brand and Pacific brand each make one). Tender, light and flaky, and loaded with tons of layers of flavor, these handheld chicken pot pies are just the grab-and-go dinner my family needs. *I just placed 1 1/4 pounds skinless boneless chicken breasts on a greased and lined baking sheet, sprinkled them on both sides with 1/4 teaspoon kosher salt and 1/8 teaspoon freshly ground black pepper and drizzled them with extra virgin olive oil. Then I placed them under my oven’s broiler for about 12 minutes, flipping them about halfway through, or until they were cooked all the way through. You can also use a store-bought gluten free rotisserie chicken, which would make things simple and still delicious! Preheat your oven to 375°F. Line rimmed baking sheets with unbleached parchment paper and set aside. Prepare the filling. In a medium-size, heavy bottom saucepan, heat the olive oil over medium-high heat. Add the onion, celery and carrot, and cook until the onions and celery are translucent (about 5 minutes). Transfer to a small bowl, and set it aside. To the same medium-size saucepan, add the 2 tablespoons butter and melt over medium heat. Add the flour blend, salt and pepper, and stir to combine well. The mixture will clump at first, and then smooth. This is the roux that will thicken the sauce. Cook over medium heat, stirring constantly, until the mixture has just begun to turn a very light brown color (about 2 minutes). Add the stock to the roux very slowly, stirring constantly to break up any lumps that might form. Add the evaporated milk and the thyme, and continue to stir until the mixture is smooth. Bring the mixture to a simmer, and continue to cook, stirring occasionally, until reduced by about one-quarter. Remove the saucepan from the heat, and add the cooked onion mixture. Stir to combine. Prepare the biscuit dough, rolling it out into a rectangle about 1/4-inch thick. While rolling and folding the biscuit dough, sprinkle with enough additional gluten free flour that you end up with a smooth dough. If using the recipe for Extra Flaky Buttermilk Biscuits from GFOAS Bakes Bread, you should expect to use up to another 1/4 cup (35 g) Gluten Free Pastry Flour. If using the biscuit recipe from the blog, you should expect to use another 2 to 3 tablespoons (18 to 24 grams) all purpose gluten free flour. 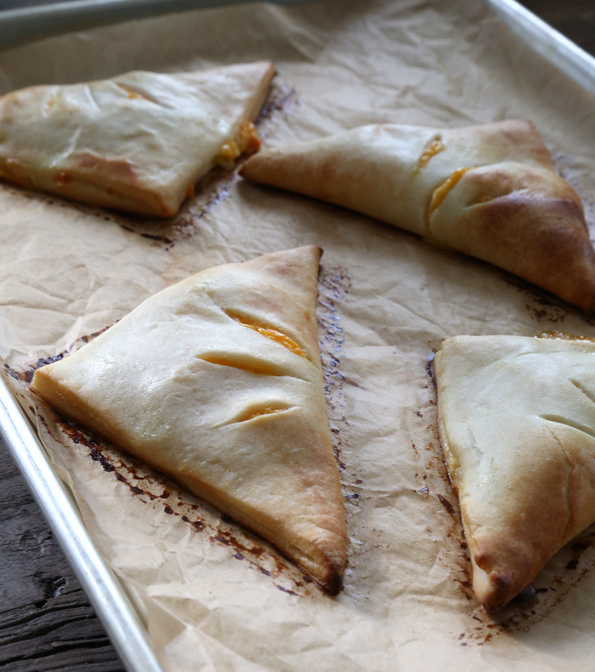 **ETA: At this point, you can freeze the shaped and filled pastries in a single layer on a baking sheet, and then pile them into a freezer-safe bag and keep them frozen until you’re ready to bake them. Then pop them in the oven and bake! You might need a few more minutes of baking time once they’re frozen solid, so just keep an eye on them. Bake the pastries. 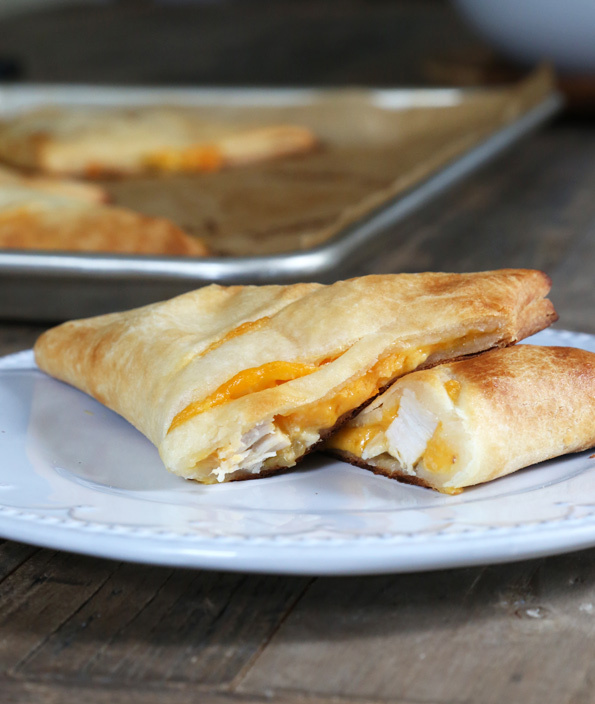 Remove the chilled turnovers from the freezer and brush each generously with the egg wash. Place in the center of the preheated oven and bake until the turnovers are puffed and pale golden all over, and more brown around the edges (about 15 minutes). Remove from the oven and allow to cool slightly before serving. Inspired by this Pillsbury Chicken To Go Biscuits recipe. P.S. If you don’t yet have your copy of Gluten Free on a Shoestring Bakes Bread, I hope you’ll consider picking one up today. Your support means so much to me! I just wanted to thank you for your amazing recipes! I made the Sugar drop cookies tonight and made a bunch of GF people verrrry happy! Next time we will frost them and have the sugar cookies we’ve been missing. I buy all of your books in physical and digital form because you make the best recipes. THANK YOU! I followed the recipe exactly (used the recipe from your GFOAS Bakes Bread—–I have all your books and am excited about your new one that’s coming out! )but my dough fell apart and tore so badly that I ended up making one big deep dish pot pie! Any ideas as to what may have gone wrong? The dough flavor was superb. Sure wish the turnover part had worked for me! I have had no problem substituting unsweetened almond milk for recipes that call for dairy. I also wanted to tell you my secret for chicken, I put several packages of chicken breasts in the slow cooker for several hours on low. I shred with a fork, then transfer 2 cups to a freezer safe bag. Defrost as needed for recipes that call for chicken. Delicious and a great time saver. Thanks for that chicken tip, Suzie! Hi, I’ve recently found your blog and am excited to try lots of your great looking recipes. I Also would love to buy your book! But I’m dairy intolerant as well and wondered if you could tell me if there is a lot of dairy (milk powder, evaporated milk products) in your book? Or would it be relativley easy to find out how to exchange for dairy free options? Thanks for your thoughts! Can’t wait to try these puppies out! Nicole, these look great! Perfect for school lunches too! The cafeteria has a microwave for the students. We just got in from the camping trip, I made your chocolate graham crackers for s’mores and it was a hit and the no bake granola bars were perfect! More of this type of recipe is a good thing! we travel a lot since we live out in the bush so we have to eat out or in the car much of the time, even when it’s a simple trip like shopping, nearest city center is at least one hours drive one way! I will definitely work on it, then, ladies! Is there a dairy free substitution for the evaporated milk? I love your recipes! I’m making carnitas tonight!! Thanks! You can try reducing unsweetened almond milk, or perhaps try using canned full-fat coconut milk (the whole can, shaken). You’ll have to experiment, though, as I haven’t tried either one! I’m so happy to hear that, Ks. Thank you so much for the kind words! I get through one or two of your recipes a week/weekend, and i think these are going to jump to the top of the list. Pizza dough will just have to wait another week, sorry pizza dough. Last week/end it was your flourless brownies and a vanilla version your no-machine brownie ice cream. I wasnt a big fan of the flourless brownies (i prefer chewy brownies) but your ice cream recipes never fail to impress :) Thank you, again, for all you do for us! Without a doubt you could use other fillings, anna! Thinks looks like a new Wednesday night dinner option for Linnea! Love it! Excellent! She will be so glad to have another option. HELLO! I’m Nicole! I make gluten-free food enjoyable & affordable. If they can make it with gluten, we can make it without. That’s a promise! No thanks, I'm not interested in free recipes. Success! I'll send you the first of four emails in the guide momentarily.